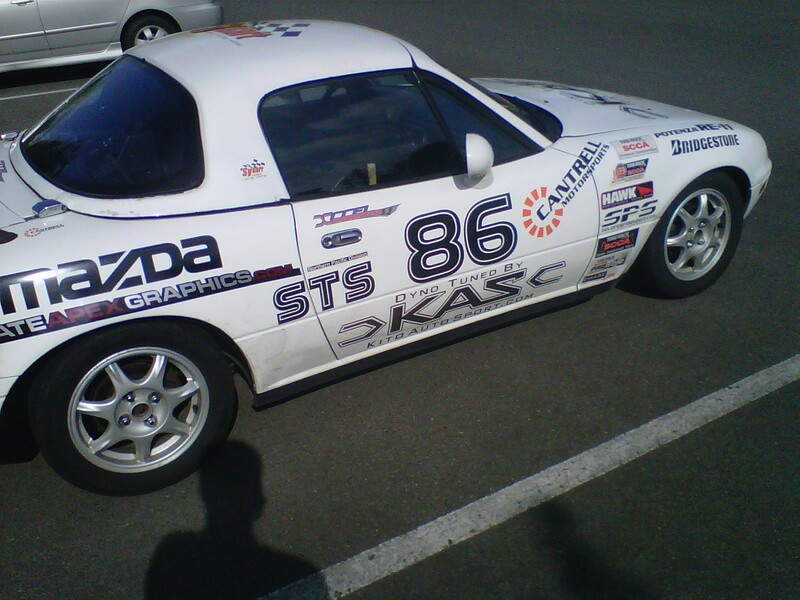 So readers know that Kyoko had just suffered a recent theft, when some punk stole the wheels off my car. While I’m still on the hunt for whoever took my RPF-1s, Bret was gracious enough to reach out and provide a set of stock late-model Miata wheels for free! (permanent +10 awesome points.) As a ‘plus’, they have some old race rubber on them, which would be good for a practice or autocross. Free track day tires! I mounted the tires and ran them for a day, just to wear the old rubber off the surface of them before moving back to another set of stock ‘daisies’ that I have sitting around. The rubber on these ‘free wheels’ are a bit squirrelly to run around on the daily streets, and dangerous if it gets wet. However in the meantime, I can’t just leave things alone now, can I? So, I spent yesterday cleaning up my new tires with chemicals and wire brushes. 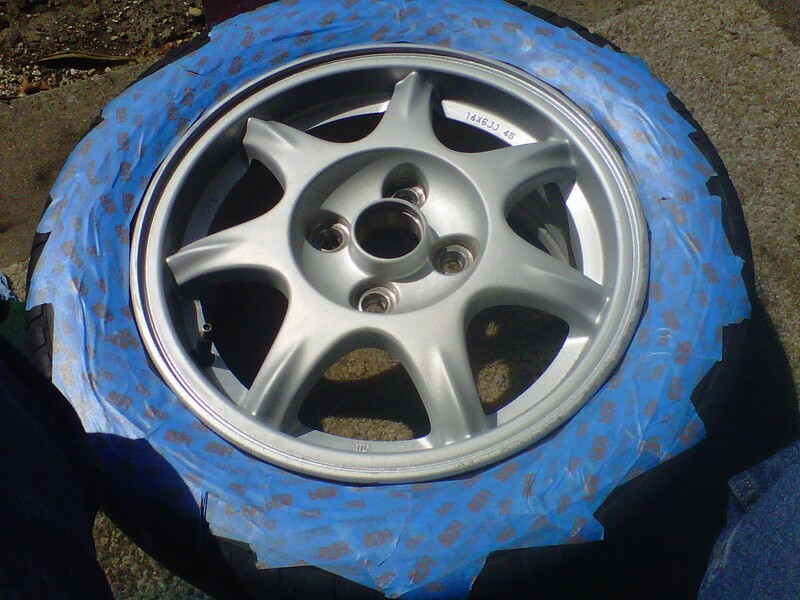 Then I took some blue metallic paint that I had around, and treated the wheels and then with several layers of clear coating. I intentionally over-sprayed them, so that they have a deep dark blue color to them. Again, I decided that these tires would make for good track day tires, once I’m finally able to get back into racing again. So as long as they look good from ten feet away, then that’s all that matters, right? 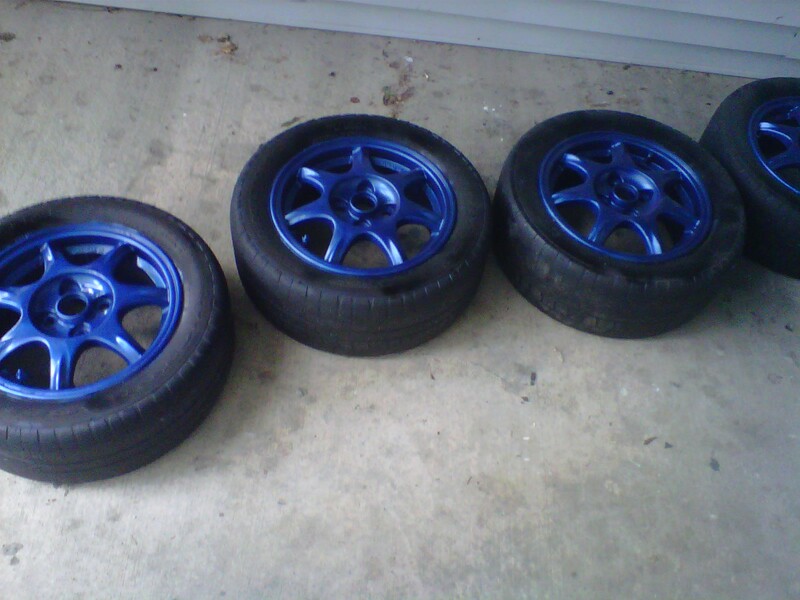 Fun Miata fact: Apparently these stock Miata wheels were made by Enkei. If you flip them over, they have Enkei stamped on the back. Who knew?! Hopefully you’ll see pictures of these tires mounted on a track day or autocross soon.